The Bharat Nikasi is the groom's wedding procession towards the wedding hall. As guests of the groom, the four of us were instructed to join in the parade. As foreign guests with little Indian wedding experience we had been clothed by Jitendra and his family members. James and Yann had on their 3-piece embroidered and beaded Indian suits. Antonia and I had were wearing rented lehangas (a long beaded skirt with matching shawl and a mid-drift bearing top). We were also wearing about 5 pounds each of rented jewelry. By the time the procession began, it was already dark. But we were surrounded by portable chandeliers being carried alongside us, plugged in to a generator being wheeled along with them. An ornate portable stage held a brass band and a singer and drove ahead of us. At the very end of the procession was Jitendra, still in the car that had driven him away from the temple hours earlier. We paraded for at least half an hour until we finally arrived in front of the hotel where the other guests awaited. Including Lucie's family members who were charged with pulling Jitendra out of the car. We had plugged up most of the traffic on Kanpur's main road, but we didn't notice because we were focusing on our dancing. Jitendra's uncles and male cousins were the most rowdy and led the way, while most of the women walked at the tail end of the parade. If the amount we had perspired was any indication of our dancing skills, then we had done a good job representing Jitendra. While the guests waited in the large hall for the bride and groom to appear a huge buffet of snack food is served. Among them, the ultimate in culinary perfection: Indian Chinese food. This had become our favourite treat since being introduced to the popular Kanpur restaurant "Talk of the Town", specializing in this amazing Indian take on Chinese food. Some of the dishes we savored were Veg Manchurian and Chili Paneer which, if their were Chinese equivalents (which there aren't) might be known as fried noodles with tofu and General Tao's cheese. While we pigged out, poor Lucie waited upstairs in a hotel room awaiting instructions. 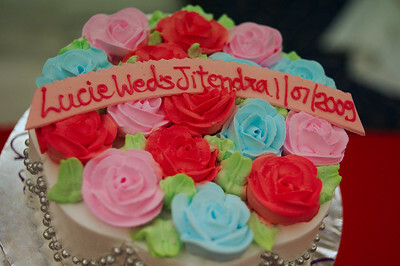 Jitendra had been formally invited into the wedding hall by Lucie's oldest brother. He sat waiting on stage as the well-fed crowd of family and friends started jockeying for position to be the first to get a glimpse of Lucie when she entered. Lucie's entrance was brilliant! Many of the younger male family members had continued outdoor procession onto the fluorescent tiled dance floor. They danced in the background to the classic "Tomber la Chemise" by French group Zebda as Lucie made her appearance alongside her bridesmaids. When they appeared at the entrance to the hall way all the guests stood up and rushed towards them cheering and taking photos. If ever there was a photo perfectly capturing a moment, it has to be the one below: Once Lucie arrives on stage, she and Jitendra exchange fresh flower garlands in a ceremony called Jaimala. They then spend the next few hours posing for photos on stage with every single wedding guest. For most of the attendees, once they have been snapped with the bride and groom their duties as guest are complete. They finish the evening with dinner served in a separate hall. The close friends and family members are the last to be photographed and the last to eat (they just stay on the dance floor waiting their turn). We had dinner in the last shift, at about midnight. An elaborate feast served by attentive waiters who never let our plate stay empty. We do not appear to have any photos of the dinner, we were too busy eating. After dinner, we returned to the main wedding hall where a four-pillared canopy called a mandap had been set up to under which the religious ceremony would take place. The ceremony would last about 5 hours, and we didn't begin until after midnight. We had been instructed to change into comfortable clothes and matresses had been set up around the mandap. Jitendra had informed us that having a nap during the ceremony was perfectly acceptable. Waiters had also been instructed to keep the espresso machines up and running. We watched the ceremony as intently as possible and I summarize its main aspects below, not because I was clever enough to note them at the time but because Lucie was good enough to do it for us. The bride receives silver rings on all five of her toes (Bichiya is the word for toe ring). The wife an older brother or cousin of the bride is the one to place the rings on her toys. Lucie and Jitendra showed off their lessons with a swing dance (minimal closeness between bride and groom). By the time they hit the dance floor it was about 6am, its amazing that they were able to even keep their eyes open. Despite Yann's pleas to continue dancing, the guests finally started to leave a little bit past sunset. We had been celebrating for close to 24 hours. As we left, Jitendra gave us instructions to be ready for the afternoon ceremonies! That the wedding wasn't actually over was news to us, but not entirely a surprise. Every day since we had arrived in Kanpur there was something wedding-related to do. The first ceremony was to begin shortly after we left the wedding, but Jitendra kindly "forgot" to call the hotel to wake us up. 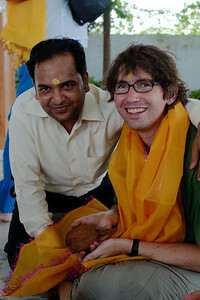 A small puja was held at the Bajpai residence in order to welcome Lucie in to the home. The evening's last event was to decorate the matrimonial bedroom. Actually, Jitendra's mother arranged to have it decorated. 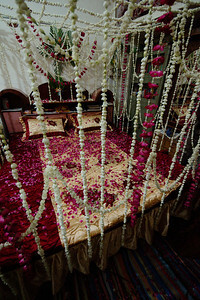 Thousands of fresh flowers were strung together and draped from the bed frame and pink flower petals were scattered on the bed itself. Other than the fact it was being supervised by her mother-in-law I can't imagine that Lucie could hope for anything more delightful. 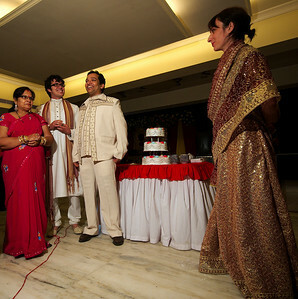 After a week in Kanpur, the wedding had finally come to an end. Fabulous Nancy! They came out perfect you're so talented. Their mouths are getting to drop.